For many years I was taught this passage had to do with wayward Christians out of fellowship with the Lord. It seemed that it was with a little glee that the teacher would set the great unwashed straight, including all those unwitting revivalists. So I filed this fact away and cut the Laodiceans some slack. But after carefully reading these verses over and over recently, and doing some investigation, i.e. Bible study, it’s hard to see the Laodiceans as backslidden—just lost. First, there’s nothing positive in this letter to the church. This is not a good sign. Then the Laodiceans are described as “lukewarm.” Not cold, not hot. And it’s hard to look beyond the fact that, as a result, the Lord will spew them out of his mouth. This can’t be a good thing! While these people were self-satisfied, the Lord described them as wretched, miserable, poor, blind and naked. The last thing they needed, in their minds, was a Savior. What they really needed was to be refined by fire, clothed in white, and healed of their blindness. What strikes me is that in their state, they were not clothed in the outfit absolutely necessary to join the throng who returns with Christ victorious. In other words, they weren’t saved. Verse 19 presents the biggest problem for me. It doesn’t seem to fit the evangelistic line of reasoning. He’s saying he loves them. Would he say that to those who weren’t his? Well, yes. John 3:16. To solve their problem, the Laodiceans had to be zealous—hot—and repent. So, I can’t see someone who hasn’t opened the door to him sitting down with him at his table, much less sitting down with him on his throne. You reserve your seat around the table and on the throne by overcoming, as the Lord did. The “knock” in this passage is rapping, i.e. striking with the knuckles, and more than that, he’s calls out at the door at the same time. He’s made a house call and it’s up to who’s inside to open the door. So much for irresistible grace! The Lord loves us enough to seek out—track down—those who are lost. He’s not lukewarm about saving the lost! 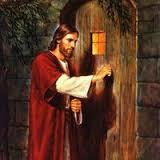 But this passage does not teach he will open the door for us. Sobering. So it’s not difficult to see this passage as compellingly evangelistic to the Laodicean church, to its members, to me, and to you! One last thing. Why would it be so easy to be “saved,” yet so hard to remain in fellowship with him? I happen to believe the Holy Spirit doesn’t let it get this far in a true believer. This entry was posted in Commentary, Devotionals, Revelation and tagged door, Jesus, John, knock, Laodicea, lukewarm, overcoming, repent, Revelation, seven churches. Bookmark the permalink.